Kul Kul Connection recognises that shared languages present the possibility for connection and establish a foundation for social sustainability. We facilitate language learning in English, Bahasa Indonesia and Bahasa Bali. 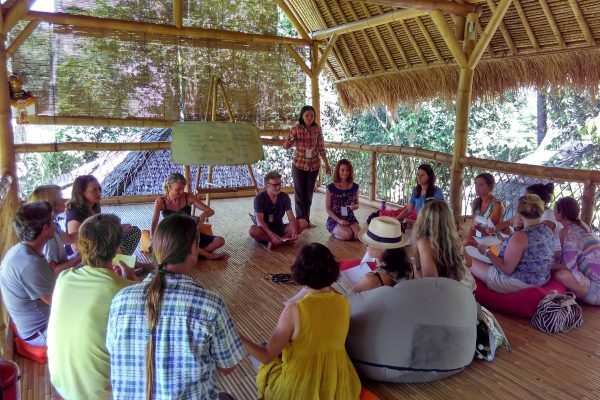 In support of local culture and language, Kul Kul Connection offers Balinese language conversation courses. Building bridges between local and international communities is made possible through shared languages. Kul Kul Connection offers Bahasa Indonesia classes to international members of the Green School community. Green School English is a Kul Kul Connection programme that supports international students learning English as a foreign language. Revenue generated from Green School English is allocated to Kul Kul Connection so that we can be a financially sustainable social enterprise within Green School.